Democratic Candidate Sharon Stinard offers “Service Above Self” for the residents of LD 16. At the Starbucks at Broadway and Power in Mesa, second time State House Democratic Candidate Sharon Stinard offered a pragmatic progressive vision for the residents of LD 16 as she prepares to go potentially against out of touch reactionary zealot Kelly Townsend and another Republican (to be determined after the primary) because the other current incumbent decided not to run in the November elections there is an “open seat” opportunity in November. In a district that includes parts of Maricopa and Pinal County, Ms. Stinard is running on a platform that emphasizes education, healthcare, infrastructure, and strategic economic development (including tax reform) and job growth. LD 16 includes parts of Eastern Maricopa county and Northern Pinal. Parts or all of Mesa, Gilbert, Queen Creek, San Tan Valley, Apache Junction, Gold Canyon, and Youngberg are within its boundaries. The district has been reliably Republican in recent elections. Ms. Stinard and Cara Prior lost to incumbents Kelly Townsend and Doug Coleman in 2016. Believing that local politics is the “foundation of our republic” and we cannot let “one side have all the oxygen in the room,” Ms. Stinard believes LD 16 voters deserve a strong voice in the legislature to advocate for economic opportunity and an equitable share of available resources,” Ms. Stinard believes, with the open seat and Ms. Townsend becoming increasingly radicalized with her positions (opposition to Invest in Ed and Medicaid Expansion) and out of touch with the people of the district (she rarely interacts with them according to Ms. Stinard), that there is an opening for her pragmatic progressive vision for LD 16. A wife, mother, grandmother, and great-grandmother, Sharon Stinard and her husband Roger have devoted their lives to serving others. While her husband served as a combat veteran during the Korean War and a retired Ohio State Trooper, Ms. Stinard followed in the footsteps of her parents and embarked on helping others as an educator of 42 years and community builder. With a degree in Business, she was a classroom teacher for 20 years in junior and senior high schools and an academic advisor and student services director/coordinator at Central Arizona College. Raised on a commitment to serve others, her community building activities include Our Saviors Lutheran Church Council, cofounding the Community Alliance Against Family Abuse women’s shelter program, presiding as President of the Superstition Mountain Rotary Club, the Volunteer Center of Pinal County, and the Superstition Arts & Cultural Alliance. She also plays French Horn in the Mesa City Band. She has received numerous awards for her service to the community including the Hon Kachina award for volunteerism. Hailing the teaching profession as “a calling,” Ms. Stinard fully supports full funding of K-12 education, including full-day kindergarten (and full day Pre K) stating that legislative decision makers “cannot shortchange youth.”. She supports the Invest in Ed Ballot Initiative and believes that there should be a dedicated funding stream and “defined” budget item (perhaps an installation of a constitutional amendment) that never allows for schools to be bilked again. She believes all people would be willing to pay more for schools if they knew where the funds were going. “Any state budget decisions must be transparent rather than introduced at the eleventh hour and passed in the middle of the night. In other education areas, she champions college/career pathways and college transition program for high school students like the East Valley Institute of Technology (E.V.I.T.). She does not believe that the Koch Learning Centers at the University of Arizona and Arizona State University should be receiving state funds. She advocates greater accountability and transparency for charter schools and is against voucher expansion and encourages a NO vote on Proposition 305. Funding for public schools has been drained away to expand for-profit and private school education and vouchers where there is no accountability and public money is placed in personal bank accounts. She does not subscribe to the Republican gospel of Trickle Down Economics for economic growth, saying that it is important to “reduce or stop reckless tax cuts or tax credits that benefit a few at the expense of the many.” She also feels that continuing to rely heavily on sales taxes to fund state government places a greater burden on the middle and low-income wage earners as well as retired communities. She is an advocate of Trickle Up Economics where one of the keys to strong economic growth is for people to have good paying jobs. She realizes that the number may be different depending on where one lives. For example, $15.00 an hour may be a possible living wage in Mesa but $13.00 might be possible in Apache Junction because of the difference in cost of living. She also feels that sound strategic economic planning, especially in still-developing Apache Junction and Gold Canyon, is essential to providing strong growth as well as embracing the nurturing of small businesses which she calls “the heart and soul of the economy.” She also believes that modern and well-maintained infrastructure (roads, highways, rail, broadband) and a quality well funded Pre-K through college education system with 21st-century career pathway programs is instrumental to economic growth. Roads and Highways: She wants the highway fund solely dedicated to road construction and maintenance and a separate revenue stream for Department of Public Safety (DPS). She finds that the Arizona Department of Transportation’s Five Year Plan (ADOT) does not do much for the East Valley. The agency has been functioning on a “starvation budget” for several years. Sharon wants more funds allocated to provide for not only maintenance but growth and improvement. She would like to see a bypass to reduce traffic through Gold Canyon. Rail and Bussing: She calls for bussing in Apache Junction that will connect with Mesa and an increase in smaller Valley Metro Van Service so people can get to a job or doctor. She wants Light Rail in Mesa to expand to Power Road where ASU in downtown Mesa will be a draw. Broadband: More access needed especially for online education. Water Supply and Storage: Supports the efforts to safeguard water supply, saying there needs to an “open dialog between all stakeholders” on how to address droughts. She also favors the drawing up of a revised drought contingency plan by the Central Arizona Water Conservation District and Arizona Department of Water Resources; especially if water levels fall to a point in Lake Mead where Arizona is penalized. Green Energy: She supports sustainable renewals at 12 percent on higher. She faults the Corporation Commission, their big Dark Money patrons, and utility companies from doing more to promote this area. She favors solar, natural gas, and wind expansion in a measured incremental fashion. She supports preserving Medicaid expansion and an opportunity (especially for Arizonans who do not qualify for the ACA exchanges or have insurance through their employer) to “buy into” Medicaid. Sharon believes that Arizona health care programs should have the opportunity to negotiate more affordable drug prices. She does not want to see a future freeze of Kids Care program enrollment and calls for an increase in mental health care and expanded programs to combat the Opioid Epidemic that every state including Arizona is facing. Programs that address drug addiction. Wrap-around programs in schools to reduce the number of school dropouts. Ms. Stinard is opposed to private prisons and wants to reform the criminal justice system so people “do not grow up in jail.” She wants to invest in preventing people from committing acts and rehabilitating them if they are arrested for petty offenses. Believing in restorative justice, she thinks the three strikes law should be recalibrated to account for petty and non-violent crimes. She calls for greater funding for combatting addiction, mental health, counselors and social workers. Alternative consequences like ankle bracelets for those who need to be monitored is much less costly for taxpayers than incarceration. If the person repeats or escalates their offensive behavior to more extreme and heinous misdeeds, a punishment should be prescribed. Saying “we have the second amendment and emphasis on responsible gun ownership is important.” While she supports school resource officers; arming teachers is not the answer to promoting school safety. She proposes on-going training for teachers to identify potential behavior health problems, reduction of class sizes to provide more individualized attention, peer guidance for students to discuss issues amongst themselves, and increase the number of counselors to identify potential danger or be there for children when they are going through difficult times before something manageable escalates to a tragedy. Emergency removal of weapons because of mental illness or domestic abuse. Restoration of gun safety education programs so people can be trained to use a weapon. Promote continual active shooter response training and retraining of police officers. 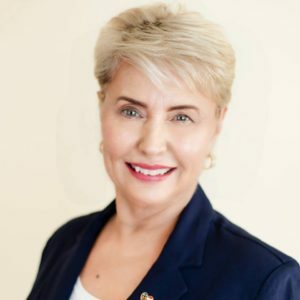 While believing that a border wall is not geographically or financially feasible, she favors the following security measures to prevent illegal immigration, and the smuggling of humans, guns, and drugs while maintaining good economic relations with this Arizona’s number one global trading partner, Mexico. Increased Border and DPS Patrols. Streamlining the temporary work visa between Canada, Mexico, and the United States. Streamline the process to get a green card and pathway to citizenship. Need to better monitor those (from the European Union, China, and India) who overstay their visas, which, according to Ms. Stinard, account for 40 percent of the illegal immigration issues. Allow the parents of Dreamers to stay while contributing to the community in lieu of being here illegally and follow a designated path to citizenship. Sharon wants Arizona to be the 38th and final State to ratify. She supports a woman’s right to make her own health care decisions. She is in favor of the Outlaw Dirty Money Initiative and expressed wonder that her incumbent opponent who is funded in part by Koch interests professes to be an apostle of small government while enacting a “Daddy State” where the Republican-led legislature has sought to interfere with local decisions (like the Tempe initiative that passed with 91 % of the vote for candidates to reveal the identity of their donors or preventing plastic or paper bag ban in Bisbee). Furthermore, she condemns Republican attempts to take over the independent Clean Elections Commission, the universities’ State Board of Regents, Early Voting and the Ballot Initiative Processes, stating that “the legislature should serve the needs of all Arizonans not to retain power for themselves.” She supports the restoration of an easier ballot initiative process and expansion of mail-in ballots. Seeing that Democrats are energized and independents are being receptive to being connected with, Ms. Stinard is eager for a second chance at one of the State House seats in LD 16 and looks forward to having a conversation with the residents of the district about her ideas for moving the area forward. Volunteerism in her campaign has increased since 2016 and she expects 25 to 30 volunteers when the election season progresses. She is running a coordinated campaign with other office seekers. They are knocking on doors, maintaining a vibrant social media and video presence, and conducting house parties and forums. She believes that it is “our civic duty to work for the benefit of others” because the “future of democracy lies in our hands.” She is honored to be “asked to serve as a legislator for the community.” This is an attitude not found in many public servants on the other side of the political spectrum. The voters in LD 16 should research where Ms. Stinard stands on the issues and go to a forum and hear what she has to say. Links to her social media sites are below. She is a candidate voters should consider for November.